We had participation from three continents in this FMT. Ron, G3SVW submitted two good readings on the K5CM 80 and 40 meter evening runs. However, 7L4IOU, Hisami still gets the distance award at approximately 6,400 miles. It was also good to have several new guys. As always, thanks to all that participated. Congratulations guys. For various reasons, this is difficult to accomplish. K0PF CO 80M in the noise (S9+), very hard to copy. 40M OK, good luck to all! Thanks Connie, 73. WA7TOF MDC 80 meters was very weak tonight here in Maryland. AE9K IN I haven't participated in an FMT in several years so I hope I did this right. I measured the VFO error against WWV at 2.5 and 5.0 MHz using Spectran software. I used linear regression to find the VFO error at 3.578390 where the I think Connie's signal was and subtracted the interpolated error from the apparent frequency. The rig used was an Elecraft K3 with a stock 5ppm TCXO. G3SVW DX K5CM positively identified on 7 MHz at 03:00 UTC, and on 3.5 MHz at 03:15 UTC on January 14th 2010. Signal on 7 MHz was S3, on 3.5 MHz S2. G3SVW QTH Manchester, UK. Equipment used FT1000MP transceiver, dipole antenna and Hewlett-Packard 3336A frequency synthesizer. W6OQI nil heard. W6OQI LAX 20 meter signals were S9 in Southern California. The east beam may have been stronger than the north west beam. 40 and 80 meters were in the S5 to S6 range with the usual Doppler. KB3MUN WPA No signal heard for either of the 13-JAN 2300 UTC 20m transmission.The 14-JAN 160m & 80m signals were faintly heard, no readable CW.My second FMT, I'm learning more about how this works with my rig. This time I used calibration spot-checks against WWV between different FMT transmissions. Next time, I plan to use a better calibration interpolation based on before & after WWV calibration measurements.My toolchain: 85' Grasswire at ZERO elevation >> LDG Z100 autotuner >> Kenwood TS-140S >> (more stuff) >> FLdigi v3.13AE.Thanks for the FMT. N5DM STX Kenwood TS-480 and DigiPan v2. 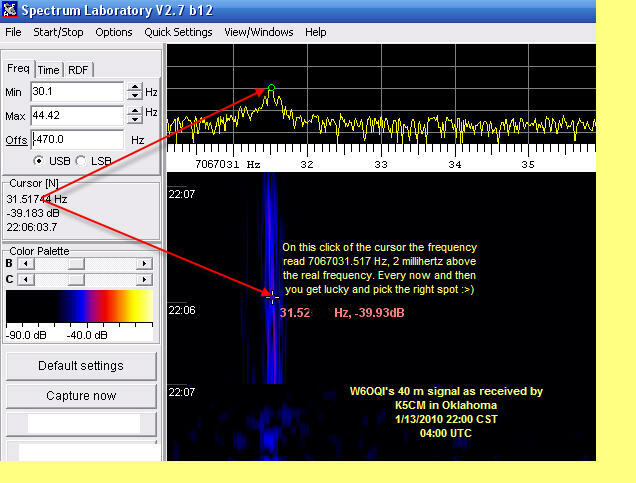 K5BTK MS Thurs morning's 40m signal was great! K5CM's 80m sigs (Wed & Thurs) were good. Everything else was weak to very faint.I read the FMT e-mail announcement just 15 minutes before the first (20m) test so had a very short warm-up. But this time the announcement came so near the actual test that I didn't forget! Thanks! KØMZ KS Thanks Connie and Marvin. Interesting propogation this time. Both 20 meter signals were extremely weak in Kansas. I had to tune audio pitch by ear and remember the tone to match pitch with transfer oscillator because signal was so weak that I couldn't hear any beat frequncy. 40 started S9 and ended into noise with a long fade. 80 was 40 over, good clear signal. Marvin's 40 was not heard at all. 80 was S2 with QSB. Connie's 160 was 40 over, very stable. 80 was also about 40 over with quite a bit of doppler. I didn't hear any signal on 40. I used a Hallicrafters SX73 for 160 and an Atlas 210X for 80, 40, and 20. Transfer oscillator is Drake TR-7. Counter is Heath IM-4100 clocked with HP 10544A tuned to WWV. All tuning is by ear. KD2BD NNJ Moderately good signals were copied from K5CM during the evening on 80 from the east coast of NJ, but signals were noticeably weaker than during the Fall ARRL FMT. Marvin's signal on 80 flirted with the noise level for about half of my measurement period, which will certainly impact measurement accuracy. Thanks to all for another challenging FMT! W1PW AZ Signals were good on all bands from both sources. 20 meter signal was above S9 with beam in either direction. Still using the FT-817nd with pre/post calibrations from 10 MHz Thunderbolt GPS reference. Then into a SL Datafile which feeds an Excel file for the calculations and corrections. Hope it all was done right! Thanks Connie and Marvin for these challenging tests! W9TJ IL 20 meters very weak, 60%copy East and 30% West. A 0.17 hz difference between East and West. 40 meters very weak both days 30% and 10% copy then below noise on morning run. Good signals on 80 both stations but lost WC 80 data in the computer. Signal on 160 was very good. Doppler was no friend this run. Again, thank you both for the opportunity to participate. WA1ABI RI Rough copy on 40m West Coast, also on the 160m and 80m morning runs. Other sigs were good; 20m was excellent. Thanks Connie and Marvin for another fine FMT. K6BZZ AZ Thanks to everyone involved for running the tests. Great fun and a challenge too. Signals all Q5 except for the 160 meter signal which was just one level above mental telepathy. K7TT WWA From K5CM - signals on 20M were about equal strength here during both east and west runs, very good. Strangely each direction resulted in a different measured frequency so the average was submitted. Signals were much weaker on 40M with nothing on 80M. From W6OQI - signals readable on both 40M and 80M but lots of noise made signals difficult to read but measured anyway. Morning K5CM runs - no 160M, readable on 80M and 40M. Thanks to both Connie and Marvin for their outstanding efforts in getting us a fmt. I continue to find it difficult every time but look forward to the next. I guess I have the fmt addiction. N8OQ VA Fun! I read the annoucement email about 30-minutes before the 20m test. I turned on the I-706MKIIG + CR282 ASAP. Typically 120 minutes are required for full warm up so my rig was still drifting during the test. This was a very good test of doing an FMT while the rig was still warming up and attendant frequency drifting. Also the best test as this wa the highest TX frequency... I still just used good 'ole WWV. The measurements, spreadsheeting, and computations were done by 23:30 but not emailed until after work the following day. Thanks. KA1BQP RI Monster signal on 20, 40 was weak, 80 was OK. Tnx Connie and Marvin. K6APW EB Evening 80M signal in and out of my noise. AA8K MI HPSDR, Thunderbolt, and Spectrum Lab. Lots of deep fades with signals only 10 to 15 dB above the noise. On 40 I had a local buzz stronger than K5CM less than 100 Hz away; love that HPSDR. No signal on 20 meters. Before the FMT I tuned in WWV and it was way off. I discovered my Thunderbolt was only sometimes seeing one satellite. I put my back up Thunderbolt on and it was fine. W9ZB IN Was away at the time of the 20M run, so I set up to record the I/Q in my home made SDR1000 receiver copy. Didn't find the signal in there after running through a couple hours of it. Was here for all other signal times and all were good except for some QSB & doppler. WB3AKD VA Only functional antenna here was a 600 ft Beverage pointed toward North Africa so 20M run did not net signals I could process although I heard both 20 M runs. (Revised Comments: actually I did get 20M data, I just had to process it a bit more as the 20 meter file was in stereo but was processed originally as though mono). 40M and 80M Wednesday runs got pretty good data. Schedule conflict scuttled Thursday attempt. FMT setup continues to improve here (well, I guess we'll see if it really is improved). Thanks again for the all the effort. N3FG EPA Noisy signal on 20M. Good signal on 40M. Weak signal on 80M. 160M was extremely weak - just a shot in the dark. Hi. Tried an IC-7200 with Spectran this time. Thanks again. It was fun. W3JW VA Good signals on all bands this time. The 20 meter signal was the weakest (particularly with the beam pointed NW) but even that one was "very measureable". Good signals on both bands from the west coast. Plenty of doppler spread on the three higher bands. Many tnx fer the test. K5CM OK Marvin, good signals on 80 meters. Thanks for the West coast run. k1ggi EMA Got at least some copy on all sigs. K5CM 160 and 80 in sunlight were tough. Had to pick the 3579 out from local tv color, watching for start/stop and spread due to keying. K5CM 20m west was weak and hundreds of mHz lower than east, but it always seems to come out closer to being right. I entered the east one anyway. Thanks for another fun one guys. 7L4IOU DX 20M was received in real time.signal was loud and clear. 40M was recorded between the absences it's also very clear too. Thank you very much! *K6OQK is 8 miles from the Transmitting station. Notice that almost all morning readings are on the high side. John's sunrise was almost 40 minutes before the 160 meter run. This shows what Marv's 80M signal looked like here in Ontario . A HP Z3801 GPS frequency source clocks a HP-3336B. A 10 db transistor amp follows and drives a 12BY7 / pair 6146. Then to the final amplifier, a Dentron 2500 running 200 watts out on 80, 40, and 20 meter AND 500 watt out on 160 meters. There are no mixers or any device in the chain of amplifiers that might impact the accuracy of the GPS frequency source. As a reality check, I periodically log the frequency source against WWV and other GPS referenced sources. I monitor each transmission with a completely separate receive system to look for any instability or short term drift. The separate system is not locked to the GPS transmitting system, but to another GPS source.